The governance baselines approach originally visualises "how the govenrance system in a specific place has responded, or failed to respond the trajectory of ecosystem change [...]. In BALTSPACE, this approach will be adapted to fit the specific requirements of MSP in a transnational setting." How did the institutional context in which MSP is implemented emerge? 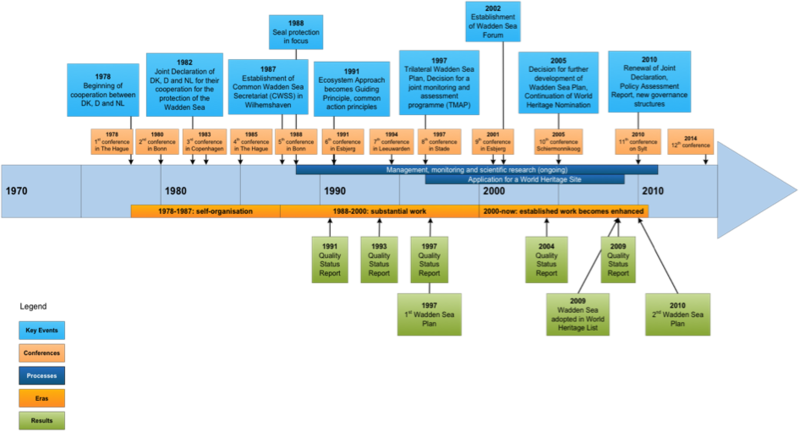 How have MSP related institutions (governance mechanisms and sectors) evolved over time? How have MSP approaches in general or specific MSP areas responded to ecosystem change? The approach was originally developed by Olsen et al (2009) to examine how governance systems respond – or fail to respond - to ecosystem changes. It has already been successfully applied to document and understand the organisational and institutional history of transnational cooperation. In the context of BALTSPACE project, the approach is used to analyse the emergence and evolution of governance systems and sectors in relation to MSP in a transnational setting. The method will be applied in conjunction with the Bow-tie approach: analysed risks and policy gaps may feed into a governance baseline while information from here may support the Bow-tie analysis. Normally, the Governance baseline is developed in collaboration with stakeholders and has two parts: a) documentation and analysis of past governance responses to ecosystem change, b) outline of a strategic approach to address management issues of a defined area. The on-going approach can produce a variety of outputs including generalised timelines of governance for a regional sea. More specifically it can highlight developing trajectories of organizations involved in governance during e.g. a MSP cycle. In the context of BALTSPACE, Governance baselines are developed for the MSP related institutions mentioned above. It encourages a long-term perspective and a holistic, ecosystem-based approach. The practice may use synergies with other approaches. Governance baselines could, e.g. support Open Standards (OS) or Bow-tie by bringing in new background information or evolutionary perspectives. The method will be further developed and applied in the context of BALTSPACE. It is not sea basin or process specific and produces generalised governance timelines for a regional sea. It can thus be transferred to any MSP process.